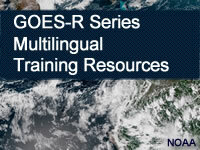 This listing of multilingual training materials for the GOES-R series includes both foundational lessons and quick guides developed by various partners at the request of the U.S. National Weather Service and NESDIS. The selections included here represent materials translated to Spanish and Portuguese. Training contributors include COMET, RAMMB/CIRA, CIMSS, and SPoRT. Translation contributors/reviewers include the Servicio Meteorológico Nacional (SMN) in Argentina and the University of São Paulo in Brazil.